Punta Cana is located on a flat and arid land so naturally there is no rafting nearby. Nonetheless in other more mountainous parts of the Dominican Republic one can definitely enjoy rafting year-round. One of the best rafting can be found around Jarabacoa. Here the rapids are class II thru class IV and the trip takes about 3 1/2 hour trip. If you really want to go rafting your hotel might have a package that will include a flight. These are some of the more reputable rafting companies in the Dominican Republic. River trips cost around US$40 to US$60 per trip. 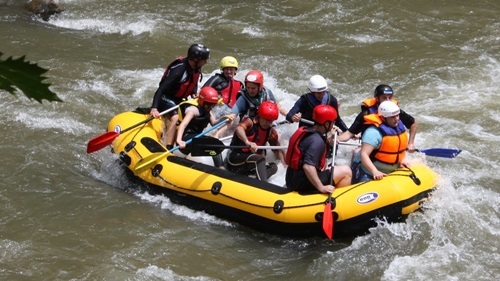 For those who prefer a more relaxing day on the river most of the rafting companies also offer river tubing.